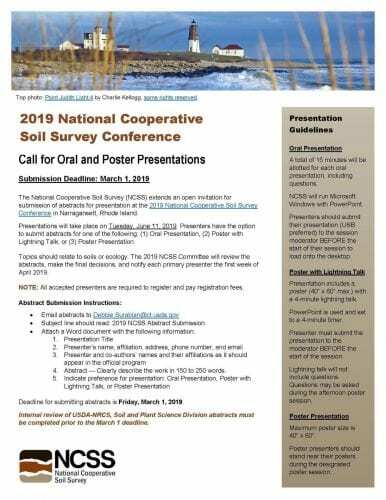 The National Cooperative Soil Survey (NCSS) extends an open invitation for submission of abstracts for presentation at the 2019 National Cooperative Soil Survey Conference, “Charting the Future of Soil and Ecological Sciences”, in Narragansett, Rhode Island. Presentations will take place on Tuesday, June 11, 2019. Presenters have the option to submit abstracts for one of the following: (1) Oral Presentation, (2) Poster with Lightning Talk, or (3) Poster Presentation. Topics should relate to soils or ecology. The 2019 NCSS Committee will review the abstracts, make the final decisions, and notify each primary presenter the first week of April 2019. NOTE: All accepted presenters are required to register and pay registration fees. 4. Abstract — Clearly describe the work in 150 to 250 words. 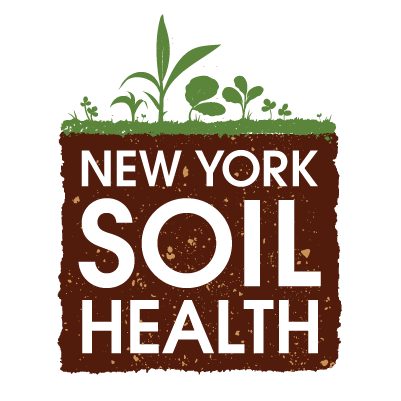 Deadline for submitting abstracts is Friday, March 1, 2019. Internal review of USDA-NRCS, Soil and Plant Science Division abstracts must be completed prior to the March 1 deadline. For more information, visit the NCSS conference website.